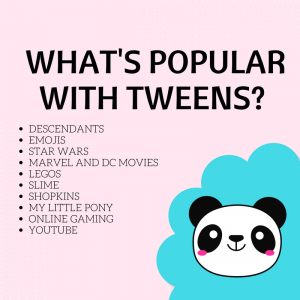 “What is popular with tweens? To help give you a jumping off point, here are a few things that my tweens say are popular. Descendants: This original Disney Channel movie has been a hit. It has left a wake of comics, books, and other merchandise that tweens are still raving about. Emojis: Emojis as a way of communication is trendy. Tweens like to use them in conversations with their friends or as a way of general expression. Libraries can harness this interest in passive programs or within program activities. Star Wars: The new movie has breathed new interest into this popular fandom. Tweens and teens of all ages are interested in watching the movies and reading books. Marvel and DC Movies and Comics: This trend is still popular. Tween boys and girls are captivated by superheros. Like with Star Wars, libraries can continue to offer displays, movies, and programs with this theme. LEGOS: the toy and movies like “LEGO Batman”, “LEGO Ninjago”, and “LEGO Friends” continue to dominate this age group. Tweens want to build with LEGOs and they want to follow everything this company releases. Slime: Tweens are taking to the kitchen to make their own slime. This trend popped up last summer but its popularity hasn’t lost any steam. This is a form of self expression and creativity that tweens are playing with at home and bringing into schools. Shopkins: This tends to be more popular with younger tweens, but it something that this age groups is passionate about. Kids especially enjoy the toys, but libraries can take this interest to theme food programs too. My Little Pony: Some tweens might deny it while others might wear it proudly, “My Little Pony: Friendship is Magic” is still a successful show and fandom. Online Gaming: Minecraft, Roblox, and Undertale continue to appeal to tweens. Programming with this theme or having this gaming available is a way this interest could be used in libraries. YouTube: As mentioned in previous posts, teens and tweens no longer watch TV. Instead, they spend their time on YouTube and on Netflix. Popular YouTubers include channels like Dan & Phil and Markiplier.